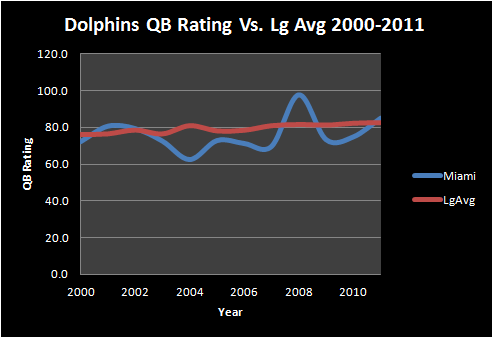 Only Chad Pennington in 2008 was significantly above average. Matt Moore, to his credit, did a pretty decent job last year – posting a QB Rating of 84.9, a little better than the 82.5 league average. To that end, Moore was statistically better than Michael Vick, Cam Newton Joe Flacco, Matt Hasselbeck, Mark Sanchez and Jay Cutler. The issue for the Dolphins is that Moore at his best doesn’t seem like the type of guy who can take a team deep in the playoffs without a great defense behind him. Of course it’s possible that he is a late bloomer and could continue to improve, but if you’re Miami, do you really want to put your future in the hands of Matt Moore? Probably not. That said, Moore’s success in 2011 is a good reason to avoid Matt Flynn who is no sure bet to be any better than Moore and is only 10 months younger. That Flynn’s former offensive coordinator and current Dolphins coach Joe Philbin wasn’t willing to make a big play for Flynn (and it seems that Miami’s interest in him was tepid) says a lot about the Dolphins valuation of Moore vs. Flynn. While Flynn might end up the better player, it’s tough to blame Miami for not seeing him as a guy worth $19-24M. Where the Dolphins do deserve some criticism though is not addressing the QB spot in the draft. They’ve wasted 2nd round picks on Pat White (2009), Chad Henne (2008) and John Beck (2007) and took a late round flier on Josh Heupel (6th round, 2001) but have otherwise ignored the position since Marino left. Looking ahead, the Dolphins will have to decide whether or not they want to invest a high draft pick in a rookie QB. Ryan Tannehill is raw but has high upside and the Dolphins could easily sit him behind the reasonably competent Moore for a year. However, will Tannehill still be around when the Dolphins are on the clock? It seems likely, but there are still more teams in need of a QB than quality veterans available so it wouldn’t be a shock if someone jumps Miami to take Tannehill or perhaps the Browns pull the trigger at #4. The other option would be Brandon Weeden, but at soon-to-be 29 years old, is he really worth a high investment for a team with a mediocre 28 year old QB at the helm? Certainly not in the 1st round but will Weeden last until Miami’s 2nd round pick? What about 2nd tier guys like Kirk Cousins, Nick Foles or Brock Osweiler? Again, it’s tough to project any of those guys as a long term answer or even a better solution than Moore. Most people who follow football know that Tom Brady is one of the all time late round draft steals – selected in the 6th round of the 2000 draft sixteen selections after Spergon Wynn and three spots before Todd Husak. He’s outlasted 10 the 11 other QB’s taken in 2000; only Chris Redman (3rd round) is also still active. More knowledgeable fans might also know that there are a few high-quality NFL QB’s who didn’t get much hype on draft day: Tony Romo (undrafted), Matt Hasselbeck (6th round), Matt Schaub (3rd round) and Ryan Fitzpatrick (7th round). These guys are often used as examples of how great QB’s can be found anywhere in the draft. Unfortunately, that’s usually not the case. Almost all successful NFL QB’s are found in the top 50 selections of the draft. However, that won’t stop NFL personnel men and general managers from trying to unearth the next Brady or Romo. Is there a hidden gem to be found in 2012? Well, by now, most NFL draft watchers know the top QB prospects: Andrew Luck, Matt Barkley, Landry Jones, Ryan Tannehill and Robert Griffin III. As we move into the Bowl season and pre-draft workouts, those five guys will get the bulk of the hype (assuming they declare for the draft) – and deservedly so. However, there are a few other guys that will go later on who could find success in the NFL as starters. As you can see, 9 of the top QB’s by passer rating were top 10 picks with Cutler and Roethlisberger both going 11th overall. It should be noted that of the five aforementioned non-Top 50 QB’s, only Romo and Brady found success with the team that drafted them. Brandon Weeden (Oklahoma State) – Based on talent alone, Weeden could be a top 50 pick in the 2012 draft. Unfortunately, he’s already 28 years old (which makes him a month or so older than Aaron Rodgers). He’s the prototypical pocket passer with the size (6’4 220) that NFL scouts love. His accuracy on short and intermediate routes is excellent, although his deep ball is somewhat lacking compared to the top QB prospects. He plays in a shotgun offense in college, which can make for a tough adjustment for some QB’s. His awareness is above average and while he’s not athletic, he’s got good enough feet to escape the rush moving outside of the picket. In order for Weeden to succeed, he will need to go to a team which can quickly work him into their offense (probably a team that runs an offensive scheme similar to Oklahoma State’s). Over-aged QB prospects have not fared well in the pros (Chris Weinke, John Beck) but Weeden has the tools to overcome the odds if he lands in the right city. I expect Weeden to go somewhere in the Top 100 picks, as too many teams need a QB to let him drop too far. In the right environment, Weeden could be a 5-7 year starter. Kirk Cousins (Michigan State) – As we run up to the draft, Cousins will get labeled with two of my least favorite (and over used) terms: “game manager” and “has intangibles”. Those types of labels are often applied to guys who get it done in college, but lack an elite attribute (e.g. arm strength, mobility, etc). When I watch Cousins I see a guy who has a well rounded, but definitely flawed, skill set: he’s got good arm strength, his accuracy at times is very good and his mobility – while not especially noteworthy – is good enough to allow him to make the occasional play. He comes from a run heavy team, which has allowed him to develop his playaction ability which is as good as any prospect in this draft. What I don’t like is that he sometimes (too often for a top prospect) seems confused by opposing defenses and has a tendency to lock onto his first read. His mechanics are sloppy and he will need a good QB coach to clean them up if he is to succeed in the pros. It’s tough to predict where Cousins will go – he needs a lot of work but he’s the type of guy which teams tend to fall in love with. I like him as a 3rd rounder but he could sneak into the middle of round, possibly even earlier. Ryan Lindley (San Diego State) – Lindley will draw a lot of attention at the combine and in his Pro Day due to his excellent arm strength but he’s definitely a raw prospect. While he can get the ball deep, he often gets the ball too deep – overthrowing his targets far too often. His short range accuracy is a bit better although still lacking. His struggles could be partially a result of overcompensating for a bad receiving corps (even more so since Vincent Brown has graduated). In an effort to avoid interceptions, he tries to put the ball where only his receivers can make a play and he lacks the finesse to do so with regularity. His mechanics tend to fall apart completely under pressure and he will need a lot of coaching before getting into an NFL game. That said, he’s got an NFL caliber arm, has shown improvement every year in college and possesses a lot of untapped potential. His rawness will probably drop him down the board a bit and he’ll almost certainly have to wait til the 3rd or 4th round before he gets drafted. Aaron Corp (Richmond) – A small school sleeper, Corp will probably have to wait until the 6th or 7th round to hear his name called (if he is drafted at all) but there is some reason to think Corp could find a home in the NFL. He does a pretty good job at reading opposing defenses and finding the open man. His arm strength isn’t great, but he’s got enough to succeed in the NFL (especially with the proliferation of the spread offense and short passing game). When he’s able to set his feet in the pocket, his accuracy is very good – he recently set the FCS all time record for single game completion percentage. Unfortunately for Corp, his O-Line is awful which has led to him getting knocked around and chased around a lot. As a result, his accuracy and decision making have been inconsistent at times. He’ll need a few years to develop, but he has some good tools with which to work.